Many a times, we carry some misconceptions…..
would mean : a welcome sound to someone; news that someone is pleased to hear.~ now read that it is not the right way and it would have been music to the ears of those lovely small creatures. It is about a statue ~ again not anything on Marina beach …. 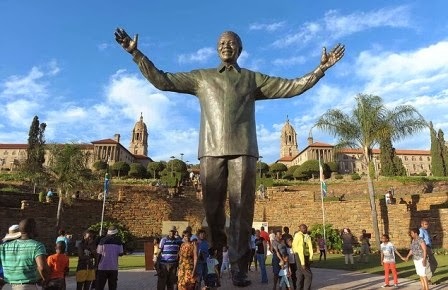 But that of a new, 9-meter (29.5-foot) sculpture of Nelson Mandela - billed as the biggest statue of the South African leader. It also has a tiny, barely visible quirk: a sculpted rabbit tucked inside. 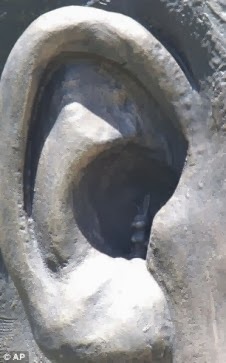 The news is that the South African officials s want to clean the ear of the bronze statue and why should it make any news at all… this is the statue unveiled outside the government complex in Pretoria, the capital, on Dec. 16, a day after Mandela’s funeral. It is because of a bunny that got into the ears…. Not a live one though !! - South Africa’s department of arts and culture says it didn’t know the two sculptors had added a rabbit, said to be a discreet signature on their work. The officials as also the public want the miniature bunny removed from the statue. The two sculptors, Andre Prinsloo and Ruhan Janse van Vuuren, behind the making of the tall statue had added a rabbit, said to be a discreet signature on their work. The bronze rabbit, sitting on its haunches with one floppy ear, is about half the height of the ear canal. The officials feels that the rabbit does not belong there as the statue represents what everyone in South Africa is proud of. The challenge now it to remove the bunny, yet retain the integrity of the sculpture without causing any damage or disfigurement – a la ‘Operation pull the rabbit out’ – like the magician doing it out of hat. The giant work stands with arms outstretched, symbolizing Mandela's devotion to inclusiveness, outside the Union Buildings, where the body of the prisoner who opposed white rule and became South Africa's first black president lay in state after his death at the age of 95. Earlier this week, South Africa's Beeld newspaper quoted the artists as saying they added the rabbit as a "trademark" after officials would not allow them to engrave their signatures on the statue's trousers. They also said the rabbit represented the pressure of finishing the sculpture on time because "haas" — the word for rabbit in the Dutch-based Afrikaans language — also means "haste." Paul Mashatile, arts and culture minister, said the sculptors have apologized for any offense to those who felt the rabbit was disrespectful toward the legacy of Mandela. The government had appointed Koketso Growth, a heritage development company, to manage the statue project. CEO Dali Tambo, son of anti-apartheid figure Oliver Tambo, said he was furious when he heard about the rabbit, and said it must go. "That statue isn't just a statue of a man, it's the statue of a struggle, and one of the most noble in human history," Tambo said. "So it's belittling, in my opinion, if you then take it in a jocular way and start adding rabbits in the ear." 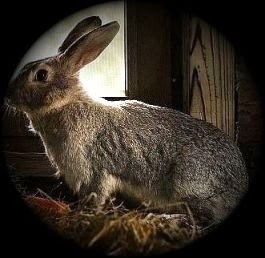 The government said it was unaware of the rabbit's existence until a local newspaper brought it to their attention. Built at a cost of eight million rand (about $830,000), the 4.5-tonne sculpture is the largest of Mandela statues erected around the world. Now those at helm of South Africa know how difficult it is to have a statue and maintain it………… perhaps they might like to travel down to Marina beach to see the many statues lined up – of which that of Sivaji Ganesan has been ordered by the High Court to be removed from its present position. According to some reference, Micheleangelo’s statue of Lorenzo de' Medici at San Lorenzo in Florence discreetly rests its arm on a money box. Keep your eyes and ears open ~ for lot of things keep happening around. Olivia Munn.... double plaits .. and horse..
Tablet browsing in Senegal - Equinox cybercafe. welcoming Thai Pongal .... pongalo, pongal..
Schumacher injury ..... Nancy Kerrigan whacked ! !